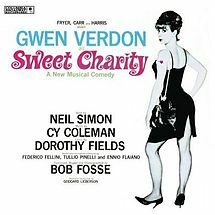 “Baby, Dream Your Dream” was one of the hit songs from the very successful Cy Coleman – Dorothy Fields 1966 musical Sweet Charity, directed by Bob Fosse and starring Gwen Verdon. “Baby, Dream Your Dream” was sung by Helen Gallagher and Thelma Oliver. Close your eyes and try it. Dream that I can buy it. Not only bought but paid for. With a walk in closet. We’ll spend all our money. They will love you, honey. Life will be frozen peaches and cream. “Baby Dream Your Dream” was recorded on December 14, 1965 and released in 1966 as a single; it was also released in 1967 on the album For Once In My Life. It was arranged by Johnny Mandel.